I remember my Mom making something similar to this when I was a kid. This recipe has been around and around. I found it again in an old issue of Family Circle. It is so good and easy. It uses simple ingredients and makes 16 servings. Lots of smiles guaranteed! In a large bowl, mix together cereal, toasted almonds, toasted coconut, brown sugar and butter. Press half of mixture into bottom of 13-by-9-by-2-inch baking dish and chill slightly. 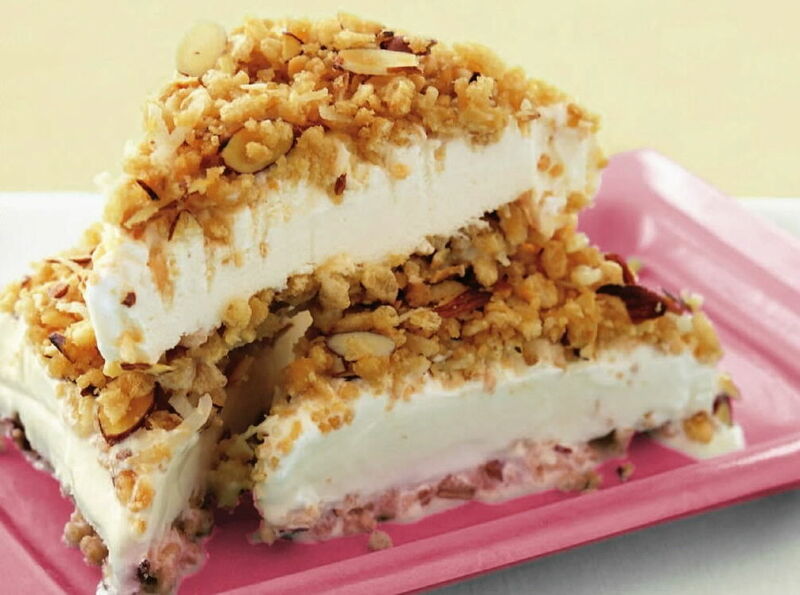 Spoon softened ice cream over chilled crust and press evenly, using waxed paper and your hands. Top with remaining crumb mixture. Cover and freeze for at least 4 hours or overnight. To serve, cut into 8 equal squares. Cut each square diagonally into triangles. Drizzle with caramel sauce, if desired.